The coastline at the Cape St. Mary's Ecological Reserve on the Avalon Peninsula in Newfoundland, Canada has some extremely sheer cliffs. 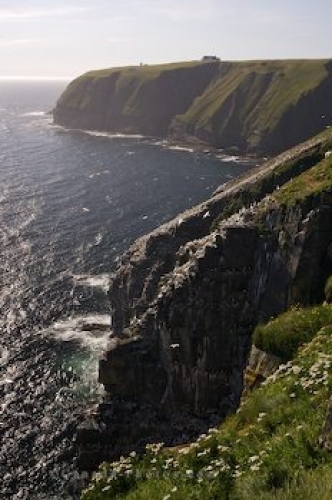 Steep cliffs along the coastline at Cape St. Mary's Ecological Reserve in Newfoundland Labrador, Canada brings many tourists here for the scenery and to visit the Northern Gannet Colony. The Gannets love the cliffs here and during the breeding season there are over 24,000 that reside upon Bird Rock which is easily accessible to tourists. Sheer cliffs and coastline at the Cape St Mary's Ecological Reserve, Cape St Mary's, also known as The Cape, Highway 100, The Cape Shore, Placentia Bay, Avalon Peninsula, Newfoundland, Newfoundland Labrador, Canada. Picture of the steep cliffs at Cape St. Mary's Ecological Reserve in Newfoundland, Canada.